I hope you are doing well. I am updating you all on where I have been for the last couple of months. 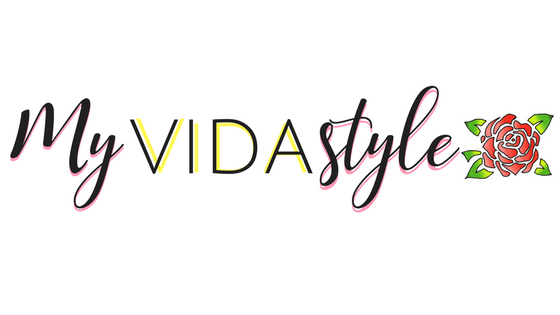 If you haven't been following me on my social media channels and don't really know who I am well let me give a quick snippet. For the last two years, I have been pursuing my Master's Degree in Education and been on the hustle don't stop mode. This is something that I discovered early in my career that I needed to do in order to have the career and life I want for myself. 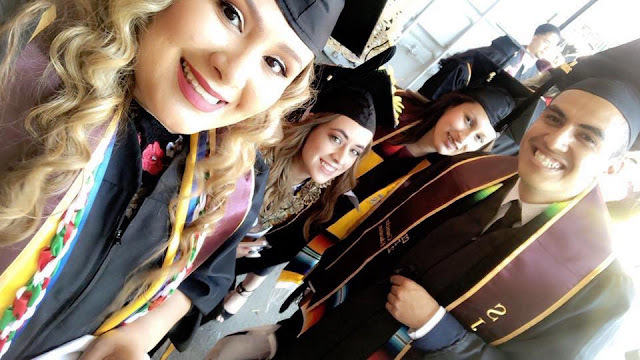 As a first-generation Latina if you were to ask me back in high school telling that I was going to pursue a Master's Degree I would have been like no way?! More school?! What's grad school? Honestly, I didn't even know what graduate school was up until my second year of college when I heard about it but never fully paid attention because at that point I just wanted to graduate from undergraduate and get my grades up. I honestly didn't do so well during undergraduate so I automatically disqualified myself from ever pursuing more school and let alone a graduate degree. My thoughts were "Para qué?, Yeah right? With a Bachelor's degree that's enough right?" Boy, I was wrong. My 2014 Undergraduate graduation program. Quote states: "When nothing is certain, everything is possible"
It wasn't until I started working in education where I discovered that if I wanted to continue to do the work I love I needed to have the education, knowledge and actual credentials to one day be a full-time educator. I am thankful that through my experience in the Destination College Advising Corps-UC Berkeley program that they exposed me to the idea of graduate school as a reality for me regardless of my GPA. Through amazing mentors and educators that inspired me and motivated me to pursue a graduate school, I applaud them for their help, reassurance, and guidance that they provided to me. They knew that it was possible and saw my potential to pursue graduate school. "Cuando nada es seguro, todo es posible", "When nothing is certain, everything is possible". 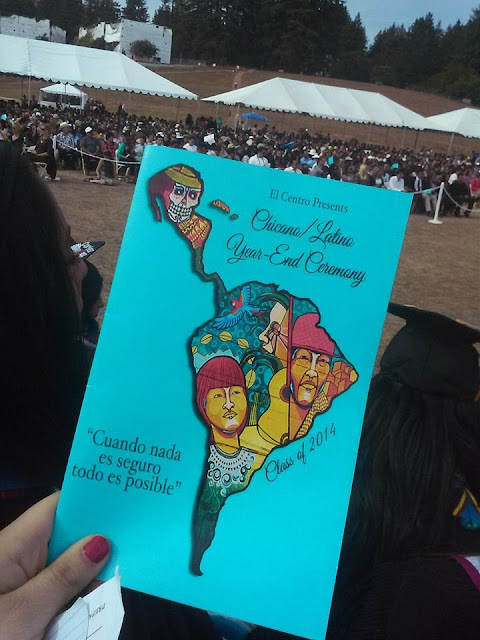 Just like the quote on my 2014 undergraduate Chicano/Latino graduation ceremony program (pictured above). Sometimes you need a little reminder from other people letting you know that it is possible and you can dream big. 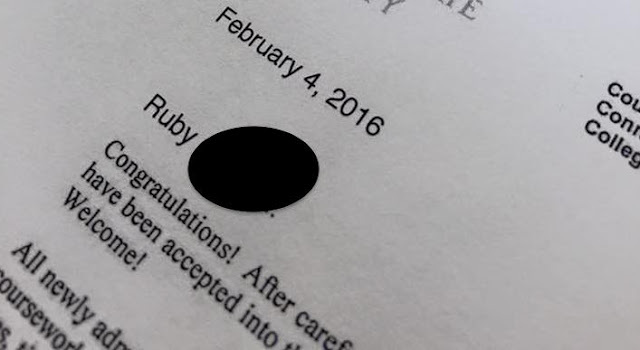 On February 4th, 2016 I received my acceptance letter and that is the day my life changed forever. I read the email, click on the official letter and read it line by line. I got into graduate school, I was going to get a Masters. This was crazy! I couldn't believe it, I was so happy I clicked yes right away. I was excited, nervous, anxious and scared because I did not what to expect. I made it a goal of mine from that day on to not limit my potential and to recognize that the possibilities are endless. Fast forward to now and about two weeks ago I have walked the stage and got hooded. I still can't believe it, I achieved a Master's Degree. Other than graduating with another degree, a credential, and certificate I also graduated something much more than an education. I studied something that I felt passionate about with people and professionals that felt the same way. I was surrounded by like-minded individuals who hustled day in and day out with full-time jobs, long commutes, families, and side hustles while going to school full-time without a complain to say. The hustle was very real these past two years and I am very blessed to surrounded by kind-hearted, funny and down to earth friends and familia. Thank you for taking the time to read this and supporting me on this journey, Also, don't let anyone or anything stop you from living the life you want. The possibilities and opportunities are endless.